This Fall season, many participants of the One Room Challenge have had to deal with effects of the recent devastating natural disasters. Participants from Texas, Florida, and California have been affected in many ways leading up to and during the ORC. Because of this, the ORC team at Calling It Home has granted all participants a one week extension. My heart goes out to each and every person affected by these disasters, I hope and pray there is a silver lining somehow as a result of the crisis. If you are joining for the first time, welcome to Happy Haute Home and week 5 of the One Room Challenge! So much progress has been made over the past 5 weeks, this project has been all consuming for my husband and myself, every spare minute has been spent in our kitchen working towards our end goal. You can catch up all our progress Week 1/Week 2/Week 3/Week 4/. Week 5 has consisted of more cabinet painting, did I mention I am painting 60 doors and drawers? And I’m still not done. To date, I have painted 2 islands and the range hood and couldn’t be happier with the results! This is the second island, the white brightens up the room considerably. I highly recommend this Benjamin Moore paint HERE and primer HERE for cabinets. 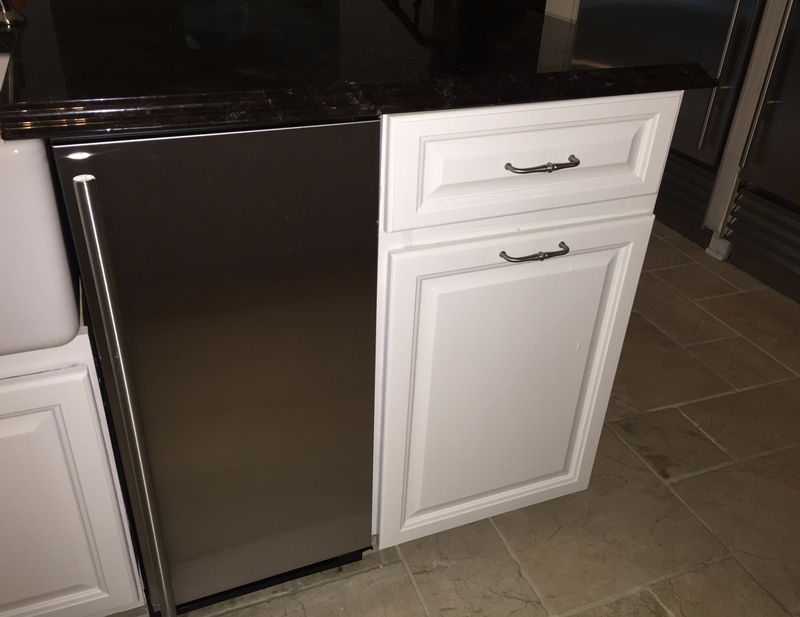 It is covering so well and giving the cabinets a very professional look. This upcoming week I will tackle the remainder of the cabinets. So far, we have installed half of the new hardware. As part of the renovation, we are replacing all cabinet door and drawer hardware from knobs to pulls HERE. The pulls have a satin nickel finish with a french country flare. To install the pulls onto the drawers, we used wood putty to fill the middle hole, sanded and drilled 2 new holes. Another big job completed in our kitchen was replacing the fireplace surround. I love having a fireplace in the kitchen for those chilly nights we’re cooking dinner, or just hanging around the island. It’s important to have a cozy fireplace area, and I wasn’t getting that feeling from our mantel. At first glance it doesn’t look too bad, right? Except for the fact that the fireplace is inset into the wall and the mantel is placed on top of the side walls, leaving a large gap between the mantel and the actual fireplace. It really bugged me! So the mantel comes down and the TV goes up. We selected a Samsung TV HERE that fits exactly into the space. Samsungs are among our favorite TVs for picture quality. We have never had problems with our Samsung TVs, and we have owned many, we highly recommend them for overall quality. For aesthetics, we could have opted for a smaller TV which would allow space to show around the sides…but nope….in our opinion…the larger the better. The size of the TV should fit the size of the room. We have hung so many TV’s over the years, my husband has become an expert in selecting the best TV mount for the job. This TV is mounted to the wall using a SANUS mount HERE. We buy all our TV mounts through Amazon and have been more than satisfied. We like to be able to tilt the TV, pull it away from the wall, and move it left or right if we choose. Removing the mantel and marble tile surround tore up the drywall quite a bit. We installed Sheetrock and mudded the walls. Sheetrock has fire resistant panels, and is safer to use around a fireplace than regular drywall. For the surround, we chose a black/silver stacked stone or ledger stone, similar to this one HERE. These pieces are great, come in 6 x 24 inches and don’t require grouting. For the mantel, we bought a rustic piece of timber SIMILAR HERE which was very easy to install, and the mounting hardware is included. To the space above the stacked stone, we added primed 8″ boards. If you are interested in finding planked boards such as these and getting the shiplap look, check out a prior post HERE. In addition, the black metal on the glass insert was showing its age. A bottle of heat resistant paint HERE gave the rim a fresh clean look. The area feels more quaint and cozy now with the large mantel removed. If this project looks familiar to my followers, that is because we renovated the other side of this double sided fireplace in the family room with a similar look, check out post HERE. Thanks for visiting, feel free to share, Pin and repost. You can also follow along on Instagram HERE and subscribe to the blog to get biweekly posts. The change to the fireplace is amazing; simply amazing. And, you’re almost there! Love what you are doing! The cabinets and hardware look fab! The stacked stone adds a rustic/country french touch! Thank you! I hope I can kill it before it kills me 😉 I blew off painting yesterday, I was too tired..thank goodness for that one week extension!